Taoiseach Enda Kenny would not explicitly rule out Revenue pursuing unpaid water charges as he repeatedly stated that all will be revealed next week. TAOISEACH ENDA KENNY would not firmly rule out the possibility that the Revenue Commissioners could pursue householders for unpaid water charges in the Dáil this afternoon. During Leaders’ Questions this afternoon the Sinn Féin leader Gerry Adams pressed Kenny for a commitment that the Revenue would not be tasked with going after people who do not pay their water charges, including potentially deducting from their social welfare payments. 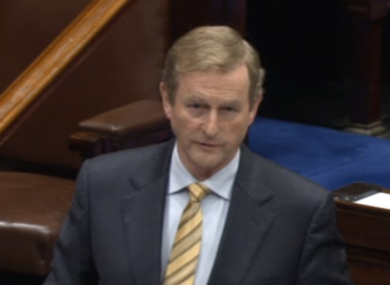 But Kenny said repeatedly that all issues related to Irish Water will be dealt with next week. He told the Dáil that government “will put at ease people’s fears and concerns” without going into specifics. Kenny also accused some Sinn Féin representatives in Sligo of giving out misinformation by telling people that all the money paid in to Irish Water is going to German banks. He also said that Irish Water will fix the first leak in houses and thereafter it will be the responsibility of householders to contact their plumber. Indpendent TD Catherine Murphy also raised the water charges issue, asking Kenny if he has confidence in the new semi-state utility. But the Taoiseach repeatedly stated that all matters related to Irish Water would be dealt with next week. Read: Will your home insurance cover water charges after a burst pipe? Email “Could Revenue go after unpaid water charges? You'll find out next week ”. Feedback on “Could Revenue go after unpaid water charges? You'll find out next week ”.